Hanging pictures on a wall is like spreading icing on a cake; it's the finishing touch. Sometimes, walls require arrangements and types of wall decor to keep them visually balanced. Consider wall size, personal preferences and existing furnishings before you select art and decor items to balance your walls. Balance pertains to the visual weight of an object, not the object's physical weight. Some framed pictures and wall decor appear heavier than others. This is primarily due to the size, color and mass of the picture. Reds, greens and blues are visually "heavy" colors, as opposed to yellows, pinks and whites. Metal wall sculptures appear lighter than framed prints surrounded by thick black frames. The metal sculpture has open areas, while the framed print has a tightly compacted mass. Symmetrical wall decor is the same on both sides. For example, hang pictures similar in size, framing and subject matter on either side of a chair to create symmetrical balance. Provide symmetry with groups of four, six or more similar pictures by hanging half on one side of the chair and half on the other side. Position each picture arrangement in a square or rectangle with about 4 to 6 inches between the pictures in a single group. Asymmetry uses different pieces of wall decor to create balance through equal visual weight. For example, hang a large framed print on the wall above the left side of a sofa. Balance out the right side with a smaller picture suspended over a wall shelf that's topped with a decorative vase and plant. Even though the wall decor isn't identical, the visual weight is distributed to achieve a pleasing balance on the wall. 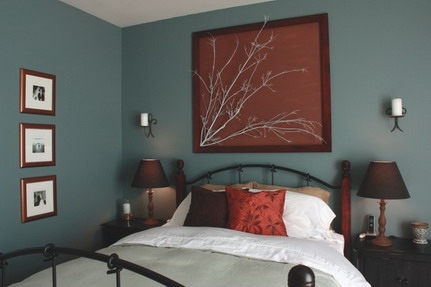 Hang wall decor at the same level across a wall to make a narrow wall appear wider. Flip this technique to help balance a wall with a low ceiling; hang wall art pieces vertically above each other, giving the illusion of a taller wall and higher ceiling. Keep your wall decor in proportion to the wall space; pictures should typically be about two-thirds the size of the furniture piece that they hang above. Server responsed at: 04/22/2019 6:26 p.m.